Sometimes during forensics investigations, it can be useful to recover deleted or temporary files transferred by users and/or processes with protocols like FTP or HTTP. Let’s see how to achieve this using pcap files! libpcap is an API which provides network packets capture facilities. Very common on Unix, there is also a version for Windows environments (logically called winpcap). Captured traffic can be saved to a “pcap file” and then be processed by another tool using the same API. Example: packets capture occurs on a Debian system and is analyzed on a Windows desktop via Wireshark. Captured traffic can not only display basic information like source IP, source port, destination IP and destination port but higher protocols (above layer 3) can also be logged up to the application layer. How to reconstruct downloaded data from a pcap file? Now, let’s extract the recorded TCP flows. During the file transfert, tcpdump logs all packets matching the given filter (port 80 and host www.myserver.com) but don’t display more information even if they are saved. The TCP flows are based on a client/server model: a flow will contain the client request and the corresponding server response. The next step will be to decode those flows based on the capture data. I’ll give two ways to achieve this: one using a GUI and a second one using the command line. Select only the server response (using the drop-box) and the raw format. Save the file to a temporary location. Note that if you perform both manipulations on the same pcap capture, the extracted files will have the same size! Hopefully! If you look at the file (warning binary data may corrupt your terminal session!) , it contains the HTTP headers response and our file (sample.pdf). Let’s strip the headers now. Check the file size (82501 bytes), it’s exactly the size of the original file downloaded with wget! Test it with your favorite PDF reader. Using this method, you should be able to recover temporary or suspicious files without too much problems. Note that some manual file manipulation might be required (Basic Unix knowledge could be a “plus”). For me it is very difficult to manage large PCAP file for analysis. So many times i have used PCAP2XML tool, for converting PCAP into XML or Sqlite and then using Sqlite browser i’m executing the queries and finding exact value. Please have a look and let me know if some other tools are available. Have a look at ‘passdown’ (https://github.com/freddyb/passdown). It could help you! Are you aware of a way to extract RTMP streams from a packet capture? I use http://xplico.org to do this. cool. can you give me an idea on how to loop the script so that it reads live packet flow and extracts several pdfs? I wrote up a similar script that I posted on my handlers’ page in 2006. 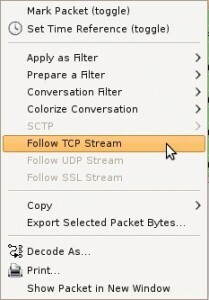 You can find it at http://handlers.sans.org/jclausing/extract-http.pl I like to use tcptrace to pull the stream in question from a pcap. Amazing how often it comes in handy.